My daughter Erica has liked flowers since the moment she realized what they were. She picks wildflowers, begs me to browse through the floral department in the grocery store, reminds me to buy her flowers for her dance recitals, and (much to my husband's dismay), insists on protecting the dandelions the stubbornly grow in our yard. She even named her favorite baby doll "Flower." 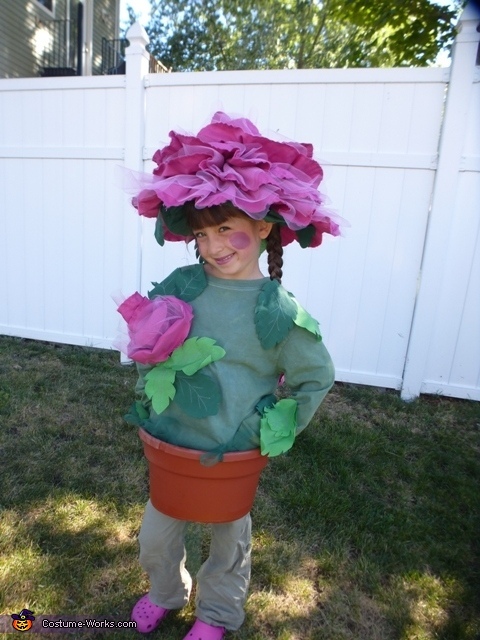 Therefore, it was natural that she chose to be a flower for her sixth Halloween, a celebration that, for us, lasts the entire month of October. She picked a pink rose, because she loves all things pink and pretty. The total cost of her costume was approximately $15-$20. I worked about 4 hours to make the hat, and then about 4 hours to finish the rest of the costume. Figure out how tall you want the petals on your hat, and then double that number. I wanted petals that were about 5" tall, so I cut fabric and tulle into strips that were 11" wide (5"x2=10", then add 1" for a seam allowance on the sewing machine). My fabric was 44" wide, so two yards of fabric yielded eight strips that were each 11" x 44". I folded the fabric lengthwise, and scalloped the edges at 5" intervals. I repeated the process for the tulle. I sewed one strip of fabric and one strip of tulle together. I ran a basting stitch along the bottom of the strip (unscalloped end) and pulled the string to gather the petals. I repeated the process eight times for each of my eight strips of fabric and tulle. I rolled the first strip into a rose bud (start from the short end) and stitched it to the top of the hat using a hand needle and thread. I used 5 additional strips of gathered fabric/tulle to make the petals of the rose, starting at the top of the hat and winding around and down to the brim of the hat. I hand stitched the petals to the hat. I covered the bottom of the hat brim with green fabric since my hat was black. I hand cut 4" green leaves from fabric, drew on veins with a silver sharpie marker, and sewed them to the brim of the hat, to mimic the base of the rose. I sprayed the whole hat with fabric stiffener, to make sure the petals and leaves stood up in the right place. Tip: use a hair dryer to speed up the drying time of the stiffener. I dyed a long sleeved white shirt with green dye. I sewed four loops of thread at even intervals around the base of the shirt; this was how I attached the pot to the shirt. I cut dark and light green leaves from fabric, about 20 total. The leaves were about 4" tall, and were cut freeform. I drew veins on the leaves with a silver sharpie marker. I sewed leaves randomly to the shirt. I sewed one rosebud each to the front and back of the shirt. I cut off the bottom of the flower pot, using a sharp knife. The pot conveniently had four holes in the lip of the pot, evenly spaced. I threaded green tulle through the holes, so I could tie the pot to the shirt (through the green thread loops on the shirt) when the pot was put on. I painted pink circles on my daughter's cheeks and added pink lipstick. Of course, I sprayed the whole flower with perfume, so she smelled delightful where ever she went! The reactions to this costume were magnificent! From the back, you couldn't see my daughter's neck – she really looked like a walking rose! The height of the hat alone was impressive, and her tiny face was peeking out from under it. The florist was impressed, and we took a picture of my daughter standing among the flowers. Kids got a kick out of her scent from her perfume, and adults marveled that her little hips fit into a real flower pot. She felt glamorous and unique, which to me, is one of the main reasons to make a homemade costume. Glad you like it...see my commentary, above!